By this time in my motherhood journey, I would consider myself a cloth diapering expert. It all started with a baby who had the world’s worst diaper rashes. I was desperate for help. Before I become a mom I wasn't fully aware of the chemicals that could be lurking around different products. Diapers included! I was using a brand that most other mama’s used (and they raved about) but it just wasn't cutting it for us. After countless trips to the pediatrician, prescription diaper cream and a fussy baby I knew it was my job as a mother to figure this out. So I started the research. 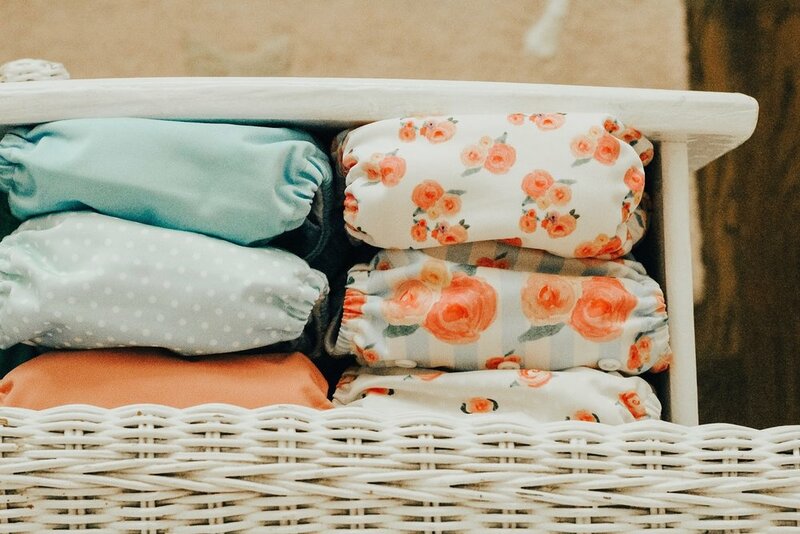 I came across a blog post about cloth diapers and thought, “Do people still do this?” Well it turns out they do and I have proudly been a cloth diapering mama for five years now. There are many perks to why families use cloth but i’ll share with you my top few. My first one was of course- the diaper rash free babe. If you educate yourself on how to properly wash and take care of your diapers, you are set. The second (and my husbands favorite reason)- saving money. Some people will tell you that the cost of cloth diapering isn't much different because it’s a bigger investment upfront. However, we decided to build our diaper stash slowly. There are many different brands of and all three of my children have done better with different brands. Think of how many diapers a baby uses from birth to potty training. If you spend two to three hundred dollars upfront, that beats the 2,000 dollars you would spend on disposables. The last one is of course- less disposables in the landfills. An estimated 20 billion disposable diapers are added to landfills throughout the country each years, creating about 3.5 million tons of waste. It takes an estimated 250-500 years for disposable diapers to decompose. When our family switched to cloth the thing that scared me the most was not being able to keep up with it and failing. I quickly realized this doesn't have to be an “all or nothing” thing. There are times we use disposable diapers, such as on trips and that just works best for us. Cloth diapers aren't meant to be intimidating, they can be used by everyone.